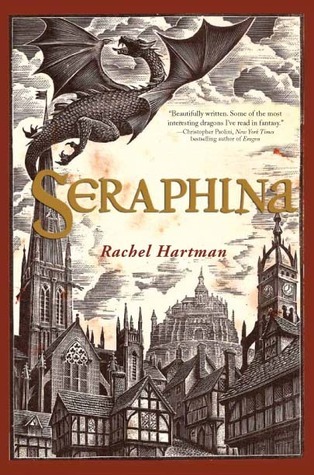 I’ve been meaning to read Rachel Hartman’s Seraphina for months now – in fact, I’ve had it out from the library as an ebook at least three times. Somehow, the time never seemed ‘right.’ When Seraphina won the Morris Award for best debut young adult novel of the year, I knew the time for procrastination was over. I started this dragon-filled high fantasy one evening and read straight through until dawn, and it was worth it. Seraphina is new to her job as assistant music mistress in the royal palace of Goredd, but she already loves it. After spending most of her life trying to remain anonymous, she’s on stage, performing music, and she’ll be noticed by those she’d rather avoid. For not only are there typical royal politics in Goredd, there are dragon politics. In two weeks a reaffirmation of the decades-long treaty between species will require everything Seraphina has and more, for she is not only a musician, but a keeper of secrets. Seraphina is an excellent book. It is also a gripping one (as my all-night reading binge will attest), and it explores important themes while remaining true to the good of the story. Education and tolerance versus the traditions of the old guard, hiding and lying versus telling the truth, loving people as opposed to protecting them, and the purpose of art – these are all woven into the fabric of Hartman’s debut. Having said all of that, the world building is the strong point of this book. It is rich, interesting, layered and unexpected, and the accompanying plot is twisty. Ultimately though, the ‘success’ of a book relies on more than world-building, plot, and big ideas. Were the characters well-drawn? Did I feel empathy towards them and witness growth? These questions are funny in a way, because the dragons of Hartman’s world do their best to remain uncompromised by emotion. They’re rather like the Vulcans of the Star Trek universe. As for Seraphina, I believed in her as a character. She’s painfully transparent, except she manages to hide a great deal of herself, and she’s lonely with it. What is harder to accept are her various relationships with other characters. As a reader, I was sucked in and I willingly followed the progress of Seraphina’s thoughts and emotions, but I trusted only her relationship with Orma – I saw weaknesses in the interactions with Glisselda, Lucian and others. The thing about being slow to believe in a major relationship in a book is that it makes you question your instincts. If you love everything else, why is it such a sore spot? I think it comes down to timing, feasibility, and the real (personal) effects of betrayal and truth-telling for the individual reader. I loved the book, but I think there’s room for improvement. I am looking forward to more (and even better) from Hartman. The right note played tentatively still misses its mark, but play boldly and no one will question you. If one believes there is truth in art – and I do – then it’s troubling how similar the skill of performing is to lying. Maybe lying is itself a kind of art. I think about that more than I should. Recommended for: fans of fantasy, dragon-loving readers, and anyone who liked Patricia McKillip’s The Forgotten Beasts of Eld, Jane Yolen’s dragon books, or Ann McCaffrey’s Pern. Sounds like a great book. I know I've been attracted to the cover, but have never read it. Will have to pick it up, thanks. I loved the world; that's what I got attached to. :) And one of my favorite parts of the book WAS the dragons lack of emotion, or their attempt at lack of emotion. I am so glad you loved Seraphina -- it truly is one of those up all night books. Also what you mentioned about the themes of education and tolerance vs. old guard is interesting and something that I agree was very well done in the book. I've read nothing in Steampunk yet :( Well I've read Dearly, Departed but that had a lot of zombies too :P Soulless is on my TBR though, I've had it on my Kindle for awhile so I'm glad to hear Alexia is a great character! Thanks for sharing your list!! I have thought and thought about reading this book, your review is getting me closer to it. I'm happy you finally had the right time for Seraphina because it is so good. And that quote is perfect for so, so many reasons. I will get to this one at some point! I haven't read a dragon book in a very long time so I'm looking forward to it. Oh jeez I really really need to read this. I read a hilarious interview type post of hers recently on another blog I couldn't stop laughing.